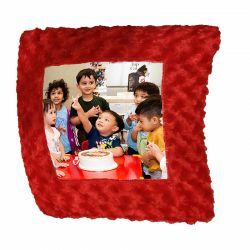 To remember your loved ones with their photos with a simple design square shape pillow. Pillow, the centre white shining cloth with your own photo/personalize and red finishing at the corners. Please include birthday wishes and baby photo(included) in this pillow.